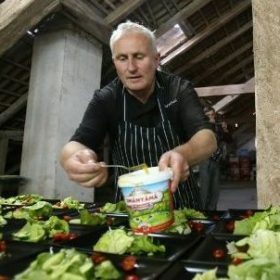 As a creative events caterer, Paul Bloomfield is recognised for his intuitive understanding of clients’ needs and for seamless delivery. His deep interest in the connections between food and culture informs his eclectic repertoire, encompassing the cuisines of Asia, the Mediterranean and the UK. Paul draws inspiration as much from his extensive travels as he does from close collaboration with other chefs, food writers and broadcasters. Claudia Roden says ‘I trust his taste and his know how. His warm personality always brings the team together to produce food as best as can be’. Paul has been a Visiting Fellow in the Oxford School of Hospitality Management at Oxford Brookes University for fifteen years, a role he uses to support students’ learning. Whether taking groups of students on volunteering projects to Transylvania or supporting charity events, he works with students to give them insights into the reality of food and drink-related professions. And as Chef Consultant to the FT Weekend Oxford Literary Festival, he ensures this major cultural event is known for its myriad of gastronomic occasions – not only as a book-lovers’ paradise.